Some home renovations are sexier than others. You know…like shiny new flooring (hardwood anyone?). A smoking new kitchen. Or glamourous new windows. Also – those kinds of renovations are easy to show off. There’s a visible improvement to your home. The investment is just so…obvious. But when you have to invest in things like a new furnace, or plumbing or say, an air conditioner, the curb appeal is ever so less than. Practical. Of course. Warmer? Flushier? Cooler? Indeed. …looking at those photos doesn’t exactly take your breath away, does it? 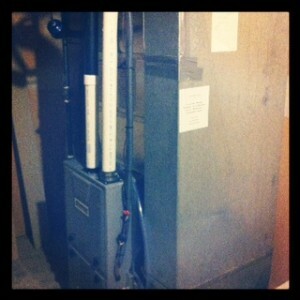 I bet you didn’t gasp, “What a gorgeous furnace!” and immediately share this post on Pinterest. Nope. These are the borr-ring…but essential home renovations. The ones you must invest in at some point or another. And geez, do they ever dig a big hole in your pocket. For this reason, you better believe that every single person who walks through my front door is getting a tour of the new furnace and air conditioner. Gasps of awe are completely optional. Oh Ayala – you always make me laugh. Yes! Thank you! You have inspired me to flood the blogosphere with photos of my new cedar hedge. And a fence! A WOODEN one! Oh, and don’t forget the new ball-and-flappers that the plumber installed in the toilets just this morning!! Ha! We *almost* had to replace our a/c this week. One $110 service call and a $21 part later we seem to be back in business. 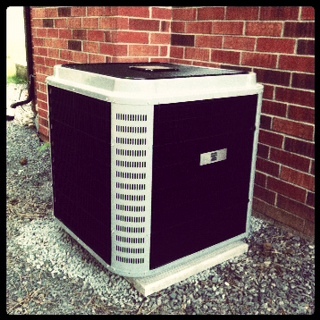 Otherwise I’d have been showing off the new a/c like crazy and telling people it was my summer vacation.